I haven't done a Weekly Geeks for a while, but this week's encompasses something that I really need to do anyway, so I am joining in again! This week’s theme is: catch up on… something. Weekly Geeks #6 was catch up on reviews week, but so many of you organized bloggers were caught up with reviews that you chose to catch up on other things. So I kept in mind that a catch-up week every now and then will probably be welcome. At this point, I’m very behind on several blog tasks, so I thought maybe you might be, too! 1. Decide what you need to catch up on. 2. Write a post if you feel like it, telling your readers what you intend to catch up on. If you do that, you can sign Mr Linky right away with the link to that specific post. 4. Write a post near the end of the week (Thursday or Friday) summarizing how your catch-up week went. If you didn’t sign Mr Linky with your intentions post, sign it with your summary post. 5. 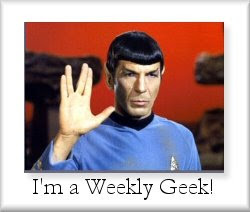 Don’t forget to visit other Weekly Geeks and encourage them in their catching up! Whilst there are numerous things that I could catch up on, what I have decided to work on is reviews for challenges. I have a number of challenges that I am very near to completing. I just need to write the reviews. I am not sure how many I will get written because I still have visitors (a fact that I am reminded of as I sit here and listen to my brother snore like a freight train! ), and lots happening this week, but we will give it a go. Good luck achieving your goal, Marg! Good luck catching up. I have to give some thought to this one. Glad to find your blog. Just started my own on reading, http://readersword.blogspot.com/. Check it out, see waht you think. Sort of reveiw, commentary, etc. Best of luck to you, any advice would be gracioulsy appreciated! Marg, we miss you! Hope you're doing okay (sounds like you're very busy) and all recovered from your illness. I need to do all of that stuff too. Good luck with all of that! It was 10 years ago today...kind of! What's on Your Nightstand and some blog pimping!